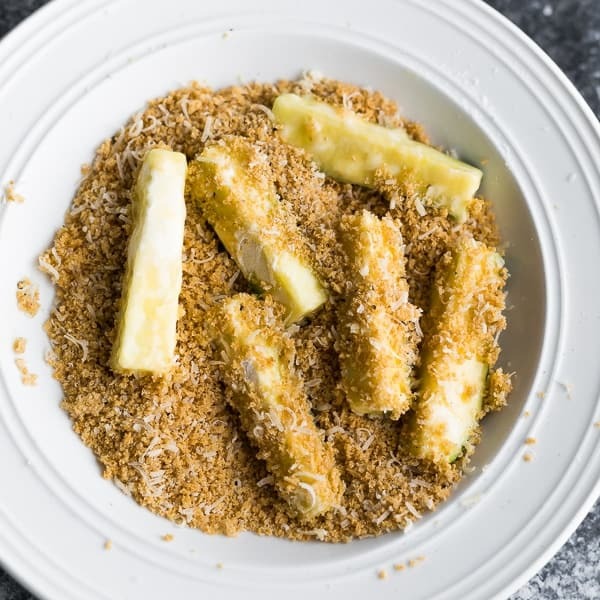 Air fryer zucchini fries are coated with a crispy parmesan panko breading and are the perfect way to use up summer zucchini! I’ve been having so much fun playing around with my air fryer ever since we bought it in December! 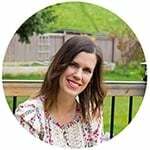 Not only is the air fryer an awesome way to get crispy food with little to no oil, but it is a really awesome alternative to the oven (which I am trying to keep off in the heat these days!). It heats up quicker than the oven and also cooks your food faster, too! I’m super excited to share these air fryer zucchini fries with you, because they were just a fun little experiment for dinner one night, but it turned into love at first bite. Ben told me I absolutely had to put these up on the blog. 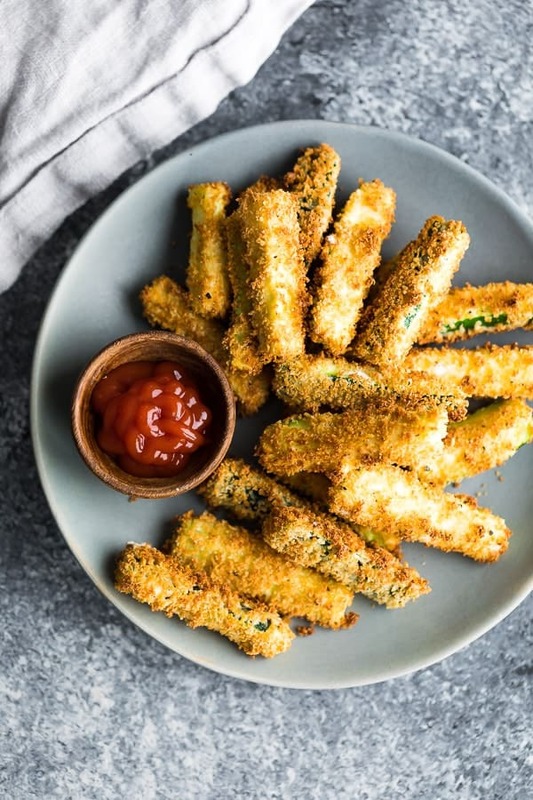 This zucchini fries recipe is really similar to my Crispy Parmesan Baked Green Bean Fries…in fact I can’t wait to try those green bean fries in the air fryer! Flour- It starts with a thin coating of flour. The flour is important as it helps the egg stick in step 2. I believe you could probably swap for gluten free flours or even low carb flours but I haven’t tried. Tap the zucchini sticks to get rid of excess flour. 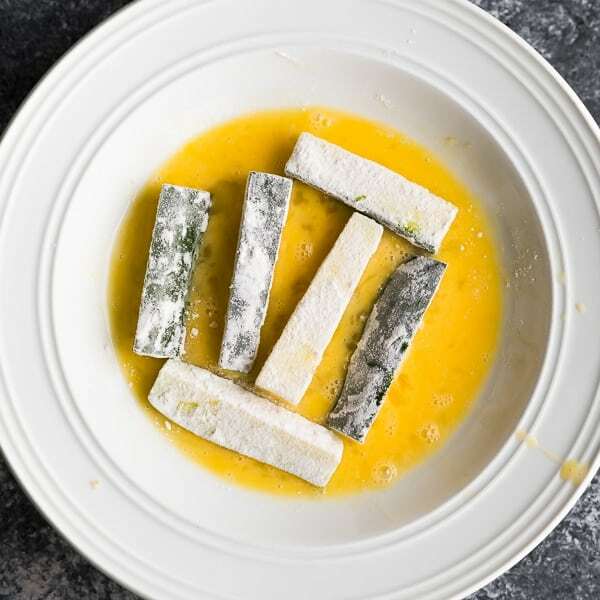 Egg- Dunk your flour-coated zucchini sticks in a couple of beaten eggs! The egg wash is important to help the breading stick in step three. 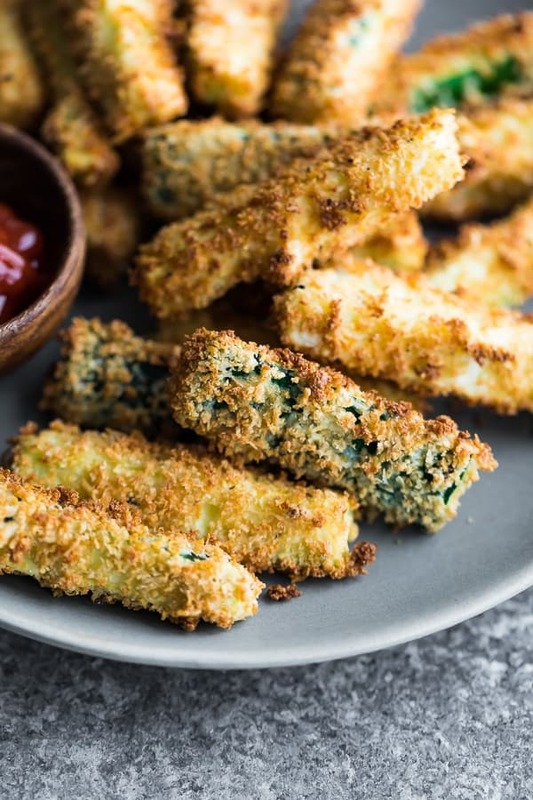 My friend Izzy has used aquafaba as an egg alternative in her Egg Free Crispy Baked Green Bean Fries, and I bet that would work for these zucchini fries as well! Breading- aka: where all that flayvah comes from! The last step is to roll your zucchini fries around in amix of parmesan cheese, panko, garlic salt and a bit of pepper. 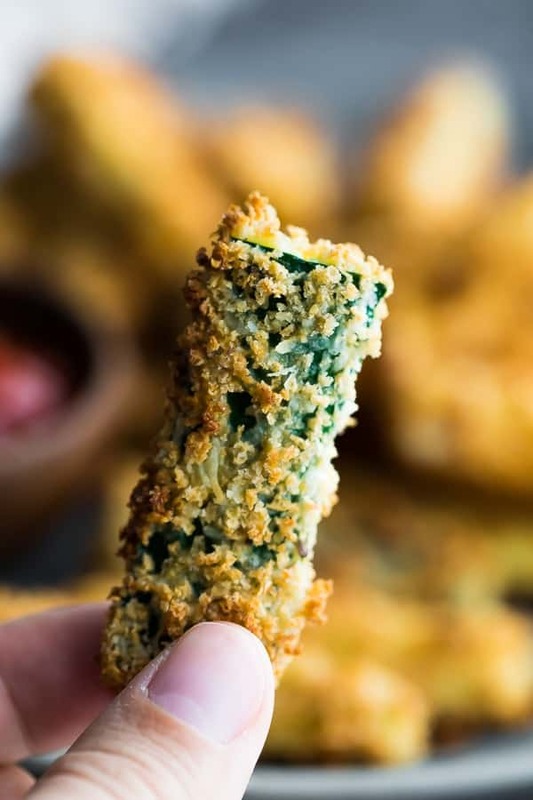 This brings alllll the yum to these air fryer zucchini fries! 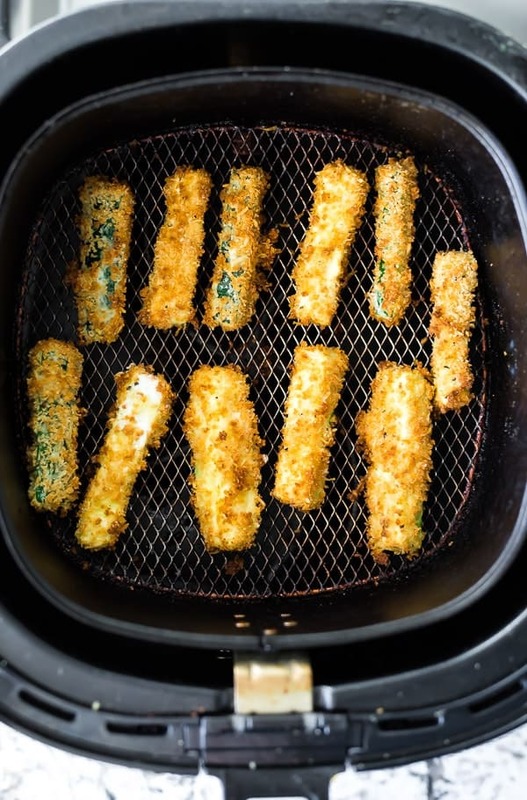 Once you’ve done steps 1-3, simply cook your zucchini fries in your air fryer for 5-7 minutes, or until crispy. You may need to work in batches because you need to leave space around the fries for them to get nice and crispy. 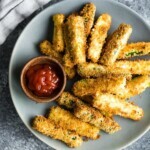 What can I dip my zucchini fries in? We loved ours dipped in ketchup! I know parmesan & ketchup don’t sound great together but they really were. I bet marinara sauce would also be awesome! Otherwise you could make a creamy dip, like the dressing for this Southwestern Kale Chickpea Salad. Can I prepare these zucchini fries ahead? I haven’t tried breading them and storing them pre-cooking, but I can tell you that leftovers were just as good as fresh once reheated in the air fryer (3 or so minutes until crispy and heated through). We stored our leftovers in the fridge for up to 3 days before reheating. Can I bake these in the oven? Yes! Simply pre-heat to 425°F and bake for 15-20 minutes. Heat air fryer to 390°F/ 200 °C. 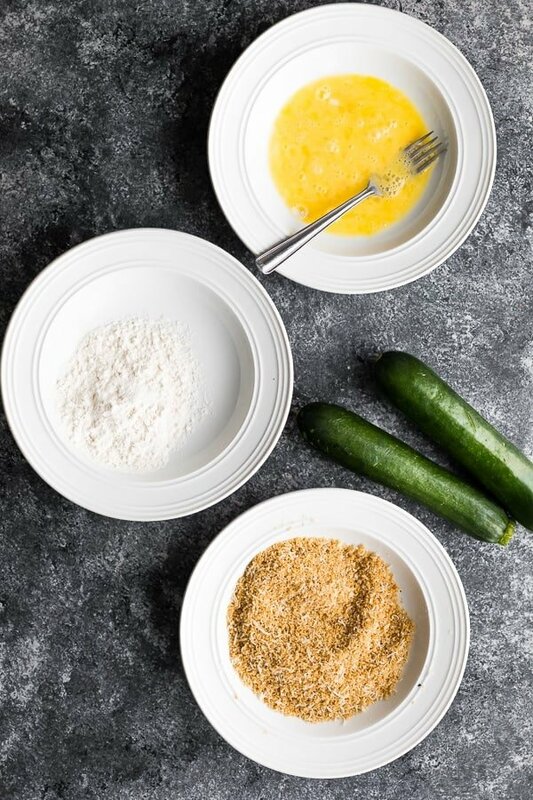 Place flour, eggs, and Panko mixture in three separate shallow bowls. Dredge zucchini in flour, then eggs, then Panko mixture. Working in batches of 8-10 fries (or a single layer in the air fryer), cook in the air fryer for 5-7 minutes, until crispy. Serve with ketchup or caesar dressing. All air fryers cook differently so keep an eye on the zucchini fries and use your best judgement when it comes to cook times. I added fresh parmesan cheese to the bread crumbs. Yummy!!! Great idea! Glad you enjoyed! Hi Susan, I’m so happy to hear you enjoyed them! Thanks so much for taking the time to leave a review. Awesome! Glad to hear that, Rex! Ok recipe didn’t say what temp thank you I’ll try this temp. Hi Sharon, it says on step one of the recipe “heat air fryer to 200°C/390°F”! Hope you enjoyed them! I’m not as impressed as everyone else. I made two batches, one w pablo and one w regular breadcrumbs. I thought they were dry. Also, my fryer is new, did anyone else experience a chemical taste? For how long? Hi Julie, I suspect it’s going to be different depending on your air fryer model. I use the Philips air fryer and have never experienced any chemical taste. Also if this is your first time using the air fryer, you should know that the texture is not ever going to be the same as deep fried, so if that’s what your expectations were for these fries, yes they are going to be dryer. We made these last night and they were truly amazing, although we subbed bread crumbs for panko and used a freshly harvested eggplant from our garden. They turned out nice and crisp. Only question is, how big of a batch did you do at once? We did them in a single layer, so to get through it all took a while in batches. Can you load up the whole tray? I’m wondering if in doing that, they might not crisp up. Hi Josh! I’m so glad you guys enjoyed them 🙂 I probably cooked 8-10 fries at a time (I have a Philips air fryer). I think it’s going to depend on the air fryer model you have…and that is true, if you tried to cook all of them at once, they will for sure not crisp up. Thanks so much for taking the time to leave a review! These turned out soggy, but if I cooked them any longer, the Panko would have burned. Hi Haleh! I’m so sorry to hear this, and honestly really surprised! We’ve made these 3-4 times as written and never had either soggy or burned issues. And my video girl made them in her model of air fryer with no issues like that as well. Could you tell me which model of air fryer you used? Thank you! Hi Denise! This is my first time visiting your blog. I’m super excited to try this recipe!! Couple of questions- 1. Do the zucchini fries need to be sprayed with cooking spray or oil mist before they are air fried? 2. Do you think this recipe will also work with yellow squash? My garden is spitting out zucchini and squash like crazy, so I’m trying to find different recipes for them. Thanks! Hi Serena! 1. I did not spray them with oil before frying. 2. I bet yellow squash would be great! I am impatiently waiting on my yellow squash plants right now. Hope you enjoy! I am so happy this recipe was posted now…as I have a feeling this recipe will be made on repeat this summer when I’m up to my ears in zucchini from my garden! Love the idea of making fries with zucchini for something different..and so glad these work in the oven too!